Returning to the track where he won the first GP of his career last year, Rockstar Energy Husqvarna Factory Racing’s Thomas Kjer-Olsen has claimed the overall MX2 class victory at the MXGP of Latvia. Putting in two strong moto performances at the Kegums track, Gautier Paulin secured his second podium result for 2018 by finishing third overall in the MXGP category. Taking place at the sandy track of Kegums, round seven of the 2018 FIM Motocross World Championship was a highly successful one for the Rockstar Energy Husqvarna Factory Racing Team. Spearheading the team’s efforts in the 250cc category was young Dane Thomas Kjer-Olsen. Leading the way from start to finish in the opening MX2 moto, Kjer-Olsen secured his first moto victory of the season. Well-placed inside the top five after the start of moto two, the FC 250 powered rider wrapped up the weekend with a strong runner-up result. Remaining third in the MX2 World Championship standings, Kjer-Olsen is now 16 points behind the provisional runner-up. Going from strength to strength following his recent knee injury, Rockstar Energy Husqvarna Factory Racing’s Thomas Covington showed good speed at the demanding Latvian track. Securing a solid third place result in the opening MX2 moto, the American was unfortunately unable to finish moto two following a crash. The GP of Latvia saw Rockstar Energy Husqvarna Factory Racing’s Gautier Paulin secure a spot on the elite MXGP class podium. Finishing fourth in the opening MXGP moto, the Frenchman improved to third in the second moto. Claiming third overall in the class at Kegums, Gautier is now just five points behind the fourth placed rider in the provisional MXGP World Championship standings. 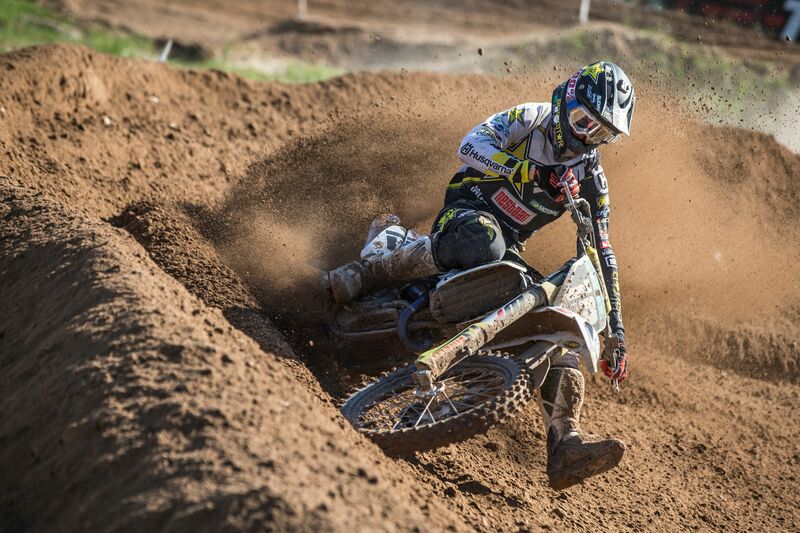 Enjoying a steady performance at the Kegums track, Rockstar Energy Husqvarna Factory Racing’s Max Anstie claimed eighth overall in the MXGP category. Securing a set of 7/9 moto results in Latvia, the Brit is looking forward to the following GP in Germany. The Rockstar Energy Husqvarna Factory Racing team will return to action at the eighth round of the 2018 FIM Motocross World Championship in Germany on May 19/20.